Wednesday bubble: a panacea for aging skin? BBC News Headline: Anti-cancer cream fights wrinkles. The cream in question is a topical chemotherapy treatment, fluroroucil, that is commonly used to manage skin cancer. Apparently, a study appearing this week in the Archives of Dermatology has shown an unexpected but welcome benefit of using flurorouciil: an improvement in the appearance of damaged skin. So what’s the lowdown on the study? 21 study volunteers suffering from photodamage and dry, scaly rough patches of skin (actinic keratoses) that result from years of sun exposure were treated with fluroroucil cream, twice daily for two weeks. They also had skin biopsies and other evaluations at the start of the study and periodically thereafter through week 24. The results showed significant changes in both the signs of actinic keratoses and photoaging/skin appearance — so much so that most of the patients said that they would be willing to undergo therapy again. Fluroroucil evidently works by causing injury to the skin, leading to wound healing and regeneration and consequently, an improved appearance. This pattern of healing mimics that seen with other cosmetic procedures used to treat photoaged skin, such as laser therapy. But here’s the rub (no pun intended): fluroroucil is associated with significant side effects that include skin irritation, dryness, peeling, scabbing, weeping and even eye irritation. It also carries a FDA pregnancy category rating of ‘X’ meaning that it can harm an unborn child, and cause miscarriages and birth defects. It’s essential to know the facts about fluroroucil, including its risk/benefits ratio. Undoubtedly the bonus of younger looking skin is enticing. And experts are already suggesting that its lower cost relative to other cosmetic treatments may promote its use beyond cancer treatment. In the coming months, it will be interesting to see how many predators adopt fluroroucil as the latest and greatest thing since the Fountain of Youth. The new million dollar promise? Apparently you can iron out those wrinkles? But not without risk. I received a request to do some posts on early menopause. But what is early menopause anyhow? And how is it different than premature menopause? While the symptoms of early menopause are similar to that of menopause after age 45, they may be more severe. Premature menopause, on the other hand, refers to menopause that occurs before age 40. Factors that influence the timing of menopause include genetics/heredity, smoking and of course, hormones. In fact, in study published last week in Publish Ahead of Print issue of Menopause, researchers found that the likelihood of both entering menopause and moving through each stage significantly increased with increases in the levels of follicular stimulating hormone (FSH) levels and declines in the levels of inhibin B (which, in studies, have been linked with a declining reserve of follicles). What’s more, current smokers had an increased 30% greater odds of moving through each menopausal stage. In a second study, presented in May at the European Society of Human Genetics Conference, researchers reported data from over 10,000 post-menopausal women demonstrating that gene mutations are responsible for regulating the timing of ovarian aging and age of menopause. More specifically, for every mutation in DNA found on chromosomes 19 and 20, almost a year and half year’s increased risk for earlier menopause, respectively, was found. Although the researchers say that more research is needed, identification may lead to better screening tools, not only to plan pregnancy (but also to potentially devise a strategy to address menopausal symptoms in a timely fashion). Okay, so your doctor has informed you that you are going through early menopause. And your symptoms are severe. What can you do? The advice for dealing with symptoms of early menopause are no different than dealing with symptoms of regular menopause – do your research, speak to a reputable, licensed health practitioner and take charge. Flashfree is a great source for discussions surrounding the evidence for or against the use of various alternative approaches for dealing with hot flashes, night sweats, mood swings, depression, irritability, weight gain, heart disease and breast cancer risks, stress and midlife in general. If you prefer, HRT is always available and your gynecologist, nurse practitioner or internist can provide you with advice and guidance. On a less positive note, early menopause has been linked to increased risk for certain conditions, including stroke, heart disease and osteoporosis. I’ll be addressing these directly in Wednesday’s Bubble. In the interim, I encourage you to peruse the site and the provided links. And I hope that you’ll feel comfortable sharing some of the steps you’ve taken to deal with this issue, not only on the physical front but also on the emotional. You’re not alone. Data from a National Consumers League survey suggest that as many as 40% to 60% of menopausal women feel irritable or moody (depending on the severity of their symptoms). Consequently, it’s not surprising that results of a recent study that appeared in the March issue of Psychotherapy and Psychosomatics suggest a medical reason for irritability during menopause as well: fluctuating hormones. Researchers evaluated irritability and depression, vasomotor symptoms and insomnia in 163 peri- and post-menopausal women attending a clinic. Participants had either never used hormones or were taking Livial. Irritability was defined as either outwardly directed (towards another person) or inwardly directed (towards oneself). They also examined the presence of high blood pressure, heart disease, diabetes or thyroid disease. The results? According to study findings, outward but not inward irritability was significantly associated with follicle stimulating (FSH) and luteinizing hormone (LH) levels (which are markers of aging ovaries). Women with chronic disease (about a third of those participating) tended to have significantly higher irritability scores, which the researchers attributed at least partially, to aging (and its association with illness) and not to menopause specifically. Like their healthier peers, outward irritability was found to be related to FSH and LH levels. No association was found between irritability and vasomotor symptoms or insomnia. So, there appears to be a medical reason for being outwardly irritable during menopause, one that has more to do with hormone levels and less, with hot flashes, night sweats and insomnia. If you aren’t willing to get on the HRT train, you might want to look into some alternatives, such as progesterone cream or soy. Self-deprecation, on the other hand, requires a bit more finesse and self-awareness to get the bottom of what ails. Regardless of how you choose to address your irritability, a general rule of thumb applies: put down the knife and breathe! Sometimes it is just that. And sometimes it’s not. Confused yet? I certainly am. Australian researchers suggest that many of the more common complaints of menopause may be possibly related to aging in general and not specifically the transition. In fact, in a study presented during last month’s 8th European Congress on Menopause, they reported that menopause is strongly associated with some but not other common complaints. So what about the other symptoms? After reviewing data from 58,724 women (ages 45 to 50) participating in the Australian Longitudinal Study on Women’s Health, the strongest associations were seen between menopause and hot flashes/night sweats. These findings remained after adjusting for age during the study, age at menopause, smoking history, body mass index, sociodemographics (i.e. education, income, marital status and geographic location) and other factors that might influence outcomes. Other symptoms, including difficulty sleeping, stiff/painful joints and poor or fair self-reported health were also associated with menopause but to a much lesser extent. Headaches, migraines and incontinence appeared to be more strongly related to the aging process. The researchers say that treatment (in this case, HRT) should be geared primarily towards alleviating vasomotor symptoms. Less clear, however, is how long therapy should be continued, since some symptoms can last for more than seven years. This study is scheduled to appear in Menopause. Last September, I wrote a post about a survey being reported at the North American Menopause Society’s Annual meeting suggesting that women can actually discern the symptoms of menopause from those of aging. Interestingly, many of the symptoms overlapped; in fact, 84%, 72%, and 77% of respondents associated vaginal dryness, urinary stress incontinence and weight gain, respectively, strictly with menopause, even though they can also be caused by aging as well. So, what’s the primary point? It can be difficult to tease apart the effects of aging and the effects of menopause. Clearly, these new Australian data add a bit more to the confusion, and reinforce the point that more research and funding is needed in this particular area. In the interim, I am just as happy to blame the ‘pause for my symptoms as I am to blame age. And equally as happy to take positive steps to overcome some of the more troublesome effects of the transition, regardless of whether it is a direct effect of menopause or not. All in all, a good thing, right? 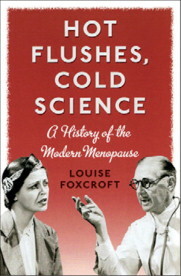 I ran across a wonderful review and commentary on Louise Foxcroft’s ‘Hot Flushes, Cold Science’ in the Lancet journal this past weekend. All of these, being sold to millions of women, of course, on the premise that menopause is truly a woman’s hell. Even though the National Institutes of Health has specifically stated that menopause is not a disease, many western practitioners continue to perpetuate the myth and line the pockets of the pharmaceutical companies. However, Schiebinger reminds us that “women’s power, including the power to say “no,” may be their best defense against the maladies” that our culture associates with menopause. I am inspired by the upsurge in interest and research into alternative approaches to address menopausal symptoms, by the strength that many women are now showing by refusing to start hormone therapy or insisting that they wean off of it, by writers like Foxcroft who are ballsy enough to confront the status quo and insist that women be encouraged to take control over their healthcare and their bodies. I started Flashfree a little over a year ago with a mission to provide timely information about alternative approaches to menopause and to encourage women to create a new paradigm about midlife and its challenges. Undoubtedly, science has its place in helping us toward some of these goals. However, only by constantly challenging and pushing back will we be able to truly become masters over our own destinies.